“It is a special and providential gift of – began the Pope – that, before leaving the Petrine ministry, I can once again meet my clergy, the clergy of Rome. It’ s always a great joy to see how the Church lives, and how in Rome, the Church is alive: there are pastors who in the spirit of the supreme Shepherd, guide the flock of Christ”. “It is a truly Catholic and universal clergy, – he added – and is part of the essence of the Church of Rome itself, to reflect the universality, the catholicity of all nations, of all races, of all cultures”. “For today, given the conditions of my age – he said – I could not prepare a great, real address, as one might expect, but rather I thought of chatting about the Second Vatican Council, as I saw it”. The Pope began with an anecdote: “In 1959 I was appointed professor at the University of Bonn, which is attended by students, seminarians of the diocese of Cologne and other surrounding dioceses. So, I came into contact with the Cardinal of Cologne, Cardinal Frings. Cardinal Siri of Genoa, – I think it was in 1961 – had organized a series of conferences with several cardinals in Europe, and the Council had invited the archbishop of Cologne to hold a conference, entitled: “The Council and the world of modern thought.” The Cardinal invited me – the youngest of the professors – to write a project; he liked the project and proposed this text, as I had written it to the public, in Genoa”. “Shortly after – he continued – Pope John invited him to come [to Rome –ed] and he was afraid he had perhaps said maybe something incorrect, false and that he had been asked to come for a reprimand, perhaps even to deprive him of his red hat … (priests laughing) Yes … when his secretary dressed him for the audience, he said: 'Perhaps now I will be wearing this stuff for the last time… (the priests laugh). Then he went in. Pope John came towards him and hugged him, saying, 'Thank you, Your Eminence, you said things I have wanted to say, but I had not found the words to say’ ... (the priests laugh, applaud) Thus, the Cardinal knew he was on the right track, and I was invited to accompany him to the Council, first as his personal advisor, then – in the first period, perhaps in November ’62 – I was also appointed as an official perito [expert-ed] for the Council”. The Pope recalled: “We were full of hope, enthusiasm and also of good will.” “I remember – he said – the Roman Synod was considered as a negative model” – where – it is said – they read prepared texts, and the members of the Synod simply approved them, and that was how the Synod was held. The bishops agreed not to do so because they themselves were the subject of the Council. So – he continued – even Cardinal Frings, who was famous for his absolute, almost meticulous, fidelity to the Holy Father said that the Pope has summoned the bishops in an ecumenical council as a subject to renew the Church. So – the Pope said – a strong activity of mutual understanding began. And this – he said – was customary for the entire period of the Council: “small transversal meetings.” In this way he became familiar with the great figures like Father de Lubac, Danielou, Congar, and so on. And this – he said “was an experience of the universality of the Church and of the reality of the Church, that does not merely receive imperatives from above, but grows and advances together, under the leadership – of course – of the Successor of Peter” . The French and the Germans – he observed – had many interests in common, even with quite different nuances. Their initial intention – seemingly simple – “was the reform of the liturgy, which had begun with Pius XII,” which had already reformed Holy Week; their second intention was ecclesiology; their third the Word of God, Revelation, and then also ecumenism. The French, much more than the Germans – he noted – still had the problem of dealing with the situation of the relationship between the Church and the world. The Pope said he saw the fact that the Council started with the liturgy as a very positive sign, because in this way “the primacy of God” was self evident”. Some – he noted – criticized the Council because it spoke about many things, but not about God: instead, it spoke of God and its first act was to speak of God and open to the entire holy people the possibility of worshiping God, in the common celebration of the liturgy of the Body and Blood of Christ. In this sense – he observed – beyond the practical factors that advised against immediately starting with controversial issues, it was actually “an act of Providence” that the Council began with the liturgy, God, Adoration. The Pope then addressed the second issue: the Church. He recalled that the First Vatican Council was interrupted by the Franco-Prussian War and so had emphasized only the doctrine on primacy, which was described as “thanks to God at that historical moment”, and “it was very much needed for the Church in the time that followed”. But – he said – “it was just one element in a broader ecclesiology”, already in preparation. So a a fragment remained from the Council. So from the beginning – he said – the intention was to realise a more complete ecclesiology at a later. Here, too, – he said – the conditions seemed very good, because after the First World War, the sense of Church was reborn in a new way. A sense of the Church began to reawaken in people’s souls and the Protestant bishop spoke of the “century of the Church.” What was especially rediscovered from Vatican I, was the concept of the mystical body of Christ, the aim was to speak about and understand the Church not as an organization, something structural, legal, institutional, which it also is, but as an organism, a vital reality that enters my soul, so that I myself, with my own soul as a believer, am a constructive element of the Church as such. In this sense, Pius XII wrote the encyclical Mistici Corporis Christi, as a step towards a completion of the ecclesiology of Vatican I.
I would say the theological discussion of the 30s-40s, even 20s, was completely under the sign of the word “ Mitici Corporis.” It was a discovery that created so much joy in this time and in this context the formula arose “We are the Church, the Church is not a structure, something … we Christians, together, we are all the living body of the Church” . And of course this is true in the sense that we, the true ‘we’ of believers, along with the ‘I’ of Christ, the Church. Eachone of us, not we, a group that claims to be the Church. No: this “we are Church” requires my inclusion in the great “we” of believers of all times and places. So, the first idea: complete the ecclesiology in theological way, but progressing in a structural manner, that is alongside the succession of Peter, his unique function, to even better define the function of the bishops of the Episcopal body. To do this, the word “collegiality” was found, which provoked great, intense and even – I would say – exaggerated discussions. But it was the word, it might have been another one, but this was needed to express that the bishops, together, are the continuation of the twelve, the body of the Apostles. We said: only one bishop, that of Rome, is the successor of one particular apostle Peter. All others become successors of the apostles entering the body that continues the body of the apostles. And just so the body of bishops, the college, is the continuation of the body of the twelve, so it is necessary, it has its function, its rights and duties. “It appeared to many – the Pope said – as a struggle for power, and maybe someone did think about power, but basically it was not about power, but the complementarity of the factors and the completeness of the body of the Church with the bishops, the successors the apostles as bearers, and each of them is a pillar of the Church together with this great body”. These – he continued – were the two fundamental elements in the search for a comprehensive theological vision of ecclesiology, meanwhile, after the ’40s, in the ’50s, a little 'criticism of the concept of the Body of Christ had already been born: mystic – someone said – is too exclusive and risk overshadowing the concept of the people of God. And the Council – he observed – rightly, accepted this fact, which in the Fathers is considered an expression of the continuity between the Old and New Testaments. We pagans, we are not in and of ourselves the people of God, but we become the children of Abraham and therefore the people of God, by entering into communion with Christ who is the only seed of Abraham. And entering into communion with Him, being one with Him, we too are people of God. That is, the concept of “people of God” implies continuity of the Testaments, continuity of God’s history in the world, with men, but also implies a Christological element. Only through Christology do we become the people of God, and the two concepts are combined. And the Council – said the Pope – decided to create a Trinitarian construction of ecclesiology: the people of God-the-Father-Body of Christ- Temple of the Holy Spirit. But only after the Council – he continued – was an element that had been somewhat hidden, brought to light, even as early as the Council itself, that is, the link between the people of God, the Body of Christ, and their communion with Christ, in the Eucharistic union. “Here we become the body of Christ, that is, the relationship between the people of God and the Body of Christ creates a new reality, that is, the communion.” And the Council – he continued – led to the concept of communion as a central concept. I would say philologically that it had not yet fully matured in the Council, but it is the result of the Council that the concept of communion becomes more and more an expression of the sense of the Church, communion in different dimensions, communion with the Triune God, who Himself is communion between the Father, Son and Holy Spirit, sacramental communion, concrete communion in the Episcopate and in the life of the Church. The problem of Revelation provoked even greater discussion: at issue was the relationship between Scripture and tradition, and above all this interested exegetes of a greater freedom, who felt somewhat – shall we say – in a situation of negativity before Protestants, who were making great discoveries, while Catholics felt a little '“handicapped” by the need to submit themselves to Magisterium. There was therefore a very concrete issue at stake: how free are exegetes? How does one read Scriptures well? What is meant by tradition? It was a pluri-dimensional battle that I can not outline now, but certainly what is important thing is that Scripture is the Word of God and the Church is subject to the Scriptures, obeys the Word of God and is not above Scripture. Yet, Scripture is Scripture only because there is the living Church, its living subject, without the living subject of the Church Scripture is only a book, open to different interpretations but which does not give any final clarity. Here, the battle – as I said – was difficult and the intervention of Pope Paul VI was decisive. This intervention shows all the delicacy of the Father, his responsibility for the outcome of the Council, but also his great respect for the Council. The idea had emerged that Scripture is complete, everything can be found therein, so there was no need for tradition, and that Magisterium has nothing to say to us. Then the Pope sent the Council, I believe, 14 formulas of a sentence to be included in the text on Revelation and gave us, gave the Fathers the freedom to choose one of 14 (formulas), but said: “One has to be chosen to complete the text”. I remember, more or less, [Latin] that the formula spoke of the Churches’ certainty of the faith is not based solely on a book, but needs the illuminated subject of the Church, guided by the Holy Spirit. Only in this way can Scripture speak and bring to bear all of its authority. We chose this phrase in the Doctrinal Commission, one of the 14 formulas, it is crucial, I think, to show the indispensability, the necessity of the Church, and to understand what tradition means, the living body in which the Word lives from the beginning and from which it receives its light, in which it was born. Because the simple fact of the Canon is an ecclesial fact: these writings are Scripture is the result of the illumination of the Church that found this canon of Scripture within herself, she found, she did not make, but found. Only and ever in this communion of the living Church can one really understand, read the Scriptures as the Word of God, as the Word that guides us in life and in death. As I said, this was a difficult discussion, but thanks to the Pope and thanks – let’s say – to the light of the Holy Spirit who was present at the Council, a document that is one of the most beautiful and also innovative whole Council was created, which demands further study, because even today the exegesis tends to read Scripture outside of the Church, outside of faith, only in the so-called spirit of the historical-critical method, an important method but never able to give solutions as a final certainty only if we believe that these are not human words: they are the words of God, and only if the living subject to which God has spoken, to which God speaks is alive, can we correctly interpret Sacred Scripture. And there is still much to be done, as I said in the preface of my book on Jesus, to arrive at a reading of Scripture that is really in the spirit of the Council. Here the application of the Council is not yet complete, it has yet to be accomplished. Finally, ecumenism. I do not want to enter into these problems, but it was obvious – especially after the passions of Christians in the time of national socialism – that Christians could find unity, at least seek unity, but also that only God can give unity. We are still on this journey. Now, with these issues, the Rhine alliance – so to speak – had done its work: the second part of the Council is much broader. Now the themes of “the world today”, “the modern era” and the Church emerged with greater urgency, and with them, the themes of responsibility for building of this world, society’s responsibility for the future of this world and eschatological hope, the ethical responsibility of Christians, where they find their guides and then religious freedom, progress and all that, and relations with other religions. Now all the players in the Council really entered into discussions, not only the Americas-United States with a strong interest in religious freedom. In the third period they told the Pope: “We can not go home without bringing with us a declaration on religious freedom passed by the Council.” The Pope, however, had firmness and decision, the patience to delay the text until the fourth period to reach a maturation and a fairly complete consensus among the Fathers of the Council. I say, not only the Americans had now entered with great force into the Council arena but also Latin America, knowing full well the misery of their people, a Catholic continent and their responsibility for the situation of the faith of these people. And Africa, Asia, also saw the need for interreligious dialogue: increased problems that we Germans – I must say – at the beginning had not seen. I cannot go into greater depth on this now. The great document “Gaudium et Spes” describes very well the problem analyzed between Christian eschatology and worldly progress, between our responsibility for the society of tomorrow and the responsibility of the Christian before eternity, and so it also renewed Christian ethics, the foundations. But unexpectedly, a document that responded in a more synthetic and concrete manner to the great challenges of the time, took shape outside of this great document, namely “Nostra Aetate”. From the beginning there were our Jewish friends, who said to us Germans especially, but not only to us, that after the sad events of this century, this decade of Nazism, the Catholic Church has to say a word on the Old Testament , the Jewish people. They also said “it was clear that the Church is not responsible for the Shoah. those who have committed these crimes were Christians, for the most part, we must deepen and renew the Christian conscience, even if we know that the true believers always resisted these things”. And so, it was clear that we had to reflect on our relationship with the world of the ancient people of God. We also understood that the Arab countries – the bishops of the Arab countries – were not happy with this. They feared a glorification of the State of Israel, which they did not want to, of course. They said, “Well, a truly theological indication on the Jewish people is good, it is necessary, but if you are to speak about this, you must also speak of Islam. Only in this way can we be balanced. Islam is also a great challenge and the Church should clarify its relationship with Islam”. This is something that we didn’t really understand at the time, a little, but not much. Today we know how necessary it was. And when we started to work also on Islam, they said: “But there are also other religions of the world: all of Asia! Think about Buddhism, Hinduism … “. And so, instead of an initial declaration originally meant only for the ancient people of God, a text on interreligious dialogue was created anticipating by thirty years what would later reveal itself in all of its intensity and importance. I can not enter into it now, but if you read the text, you see that it is very dense and prepared by people who really knew the truth and it briefly indicates, in a few words, what is essential. Thus also the foundations of a dialogue in diversity, in faith to the uniqueness of Christ, who is One. It is not possible for a believer to think that religions are all variations on a theme of “no”. There is a reality of the living God who has spoken, and is a God, a God incarnate, therefore the Word of God is really the Word of God. But there is religious experience, with a certain human light of creation and therefore it is necessary and possible to enter into dialogue and thus open up to each other and open all peoples up to the peace of God, of all his children, and his entire family. Thus, these two documents, religious freedom and “Nostra Aetate” associated with “Gaudium et Spes” are a very important trilogy, the importance of which has only been revealed over the decades, and we are still working to understand this uniqueness of the revelation of God, uniqueness of God incarnate in Christ and the multiplicity of religions with which we seek peace and also an open heart to the light of the Holy Spirit who enlightens and guides to Christ. I would now like to add yet a third point: there was the Council of the Fathers – the true Council – but there was also the Council of the media. It was almost a Council in and of itself, and the world perceived the Council through them, through the media. So the immediately efficiently Council that got thorough to the people, was that of the media, not that of the Fathers. And while the Council of the Fathers evolved within the faith, it was a Council of the faith that sought the intellectus, that sought to understand and try to understand the signs of God at that moment, that tried to meet the challenge of God in this time to find the words for today and tomorrow. So while the whole council – as I said – moved within the faith, as fides quaerens intellectum, the Council of journalists did not, naturally, take place within the world of faith but within the categories of the media of today, that is outside of the faith, with different hermeneutics. It was a hermeneutic of politics. The media saw the Council as a political struggle, a struggle for power between different currents within the Church. It was obvious that the media would take the side of whatever faction best suited their world. There were those who sought a decentralization of the Church, power for the bishops and then, through the Word for the “people of God”, the power of the people, the laity. There was this triple issue: the power of the Pope, then transferred to the power of the bishops and then the power of all … popular sovereignty. Naturally they saw this as the part to be approved, to promulgate, to help. This was the case for the liturgy: there was no interest in the liturgy as an act of faith, but as a something to be made understandable, similar to a community activity, something profane. And we know that there was a trend, which was also historically based, that said: “Sacredness is a pagan thing, possibly even from the Old Testament. In the New Testament the only important thing is that Christ died outside: that is, outside the gates, that is, in the secular world”. Sacredness ended up as profanity even in worship: worship is not worship but an act that brings people together, communal participation and thus participation as activity. And these translations, trivializing the idea of ​​the Council, were virulent in the practice of implementing the liturgical reform, born in a vision of the Council outside of its own key vision of faith. And it was so, also in the matter of Scripture: Scripture is a book, historical, to treat historically and nothing else, and so on. And we know that this Council of the media was accessible to all. So, dominant, more efficient, this Council created many calamities, so many problems, so much misery, in reality: seminaries closed, convents closed liturgy trivialized … and the true Council has struggled to materialize, to be realized: the virtual Council was stronger than the real Council. But the real strength of the Council was present and slowly it has emerged and is becoming the real power which is also true reform, true renewal of the Church. It seems to me that 50 years after the Council, we see how this Virtual Council is breaking down, getting lost and the true Council is emerging with all its spiritual strength. And it is our task, in this Year of Faith, starting from this Year of Faith, to work so that the true Council with the power of the Holy Spirit is realized and Church is really renewed. We hope that the Lord will help us. I, retired in prayer, will always be with you, and together we will move ahead with the Lord in certainty. The Lord is victorious. Thank you. The reform of the liturgy, the question of ecclesiology left wide open since Vatican I, Revelation and how we communicate it to the modern word, ecumenism and our relations with other religions but most importantly what it was really like being at the heart of the Second Vatican Council. Despite beginning with an apology for his age and how he was unable to prepare a ‘great’ discourse, Pope Benedict held the priests of Rome captive for 46 minutes on Thursday in an unscripted speech – or chat as he termed it – on the Great Ecumenical council which he attended first as a special advisor to Cardinal Frings of Cologne, and then in his own right as a theological expert. It was a sort of master class by a renowned professor and perhaps one of the last great witnesses of the Council. Pope Benedict’s voice was clear and strong as spoke of the great Constitutions that emerged from years of work by the Council Fathers. He spoke of the hope and enthusiasm of those attending that the Vatican Council, that it would lead to a reform and renewal in the Church. 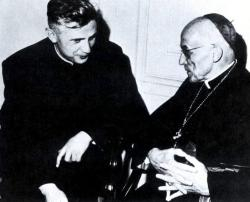 He spoke of the many heated discussions over the liturgy, Paul VI’s intervention in the debate over Revelation and the hermeneutic of Scriptural tradition of how he gave Council father’s 14 formulas from which to choose to complete their document. Benedict XVI spoke of how the horrors of the holocaust prompted wider reflection on the Catholic Churches relations with other Christian traditions and the ancient people of Israel and of the input of Council fathers from the Americas and Asia in discussions on religious liberty and interfaith dialogue. But little of this he said, filtered through at the time: “The world interpreted the Council through the eyes of the media instead of seeing the true Council of the Fathers and their key vision of faith”. “The journalists’ interpretation of the Council was political”, he continued, and as a result Council was often trivialised with disastrous consequences for the Church: “Seminaries were closed, convents were closed…the virtual Council was stronger than the real Council”. “It is a special and providential gift – began the Pope – that, before leaving the Petrine ministry, I can once again meet my clergy, the clergy of Rome. It’ s always a great joy to see how the Church lives, and how in Rome, the Church is alive: there are pastors who in the spirit of the supreme Shepherd, guide the flock of Christ”. “It is a truly Catholic and universal clergy, – he added – and is part of the essence of the Church of Rome itself, to reflect the universality, the catholicity of all nations, of all races, of all cultures”.